Sand is an underutilized terrain feature in games. 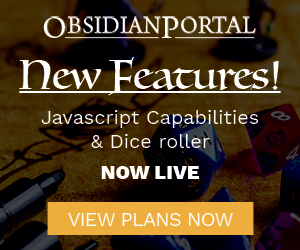 Sand is dynamic and versatile, for both GM’s and players, and it can transform a generic encounter into a shifting, swirling event full of complications and advanced tactics. Plus, it’s a beautiful backdrop for epic adventures, and has been since the dawn of storytelling. So, grit your teeth, dust off your sandals, and let’s comb the beaches for some game-changing ideas about sand. “Rumors say there’s trouble brewing within the Tevinter Imperium”; “I’ve heard tell of increased patrols by their military”; “Well I heard there’s whole tracks of land gone barren!” – if only they’d known then what we know now; that this was the beginning of the First Blight – April’s Campaign of the Month! If you love Dragon Age as much as we do, then this is an adventure you don’t want to miss! So join us as we interview jaythegreenling and find out more about this awesome campaign. Hey OPers. This has been a pretty tame week overall, with most heads down and working on things a bit longer term in scope. That said, I still have a few things to toss out there, so let’s get at it.